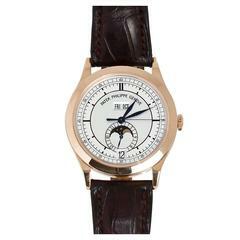 Patek Philippe Annual Men's Platinum Automatic Moonphase Watch 5056P (or 5056-P) - Automatic winding; annual calendar with day, date, month & moonphase; power reserve indicator. Platinum case with exposition back and diamond mounted between the lugs at the 6 o'clock position (36mm diameter). Gray dial with Roman numerals. Dark gray Patek Philippe strap band and platinum buckle. Pre-owned. 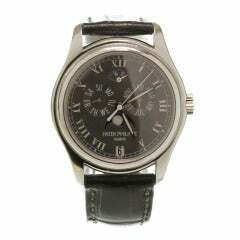 An 18k White Gold Annual Calendar Wristwatch by Patek Philippe. Model 5146G. Grey Dial. 39mm Case Diameter. Automatic Movement.